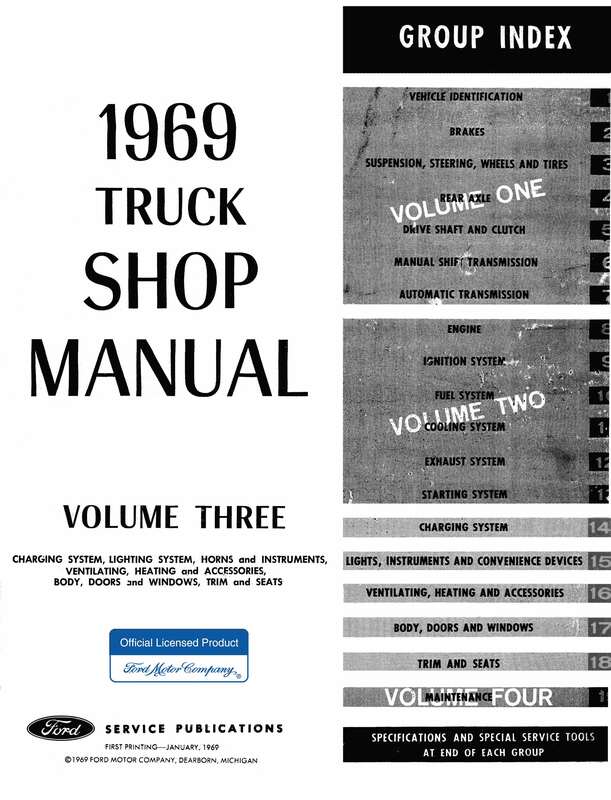 1969 Ford Truck Shop Manual is the set of four bound manuals that Ford mechanics used to service vehicles. 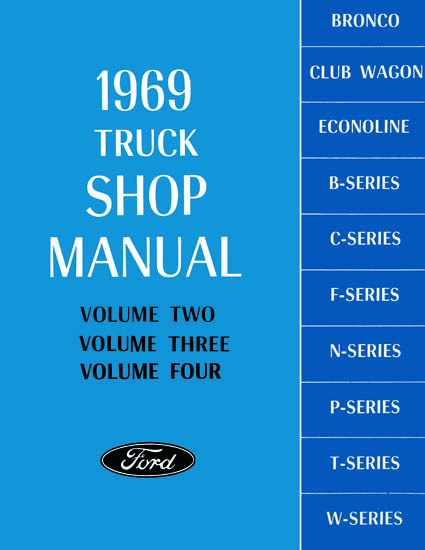 It includes the: 783 page "1969 Truck Shop Manual Volume One," the 560 page "Volume Two," the 271 page "Volume Three," and the 132 page "Volume Four." 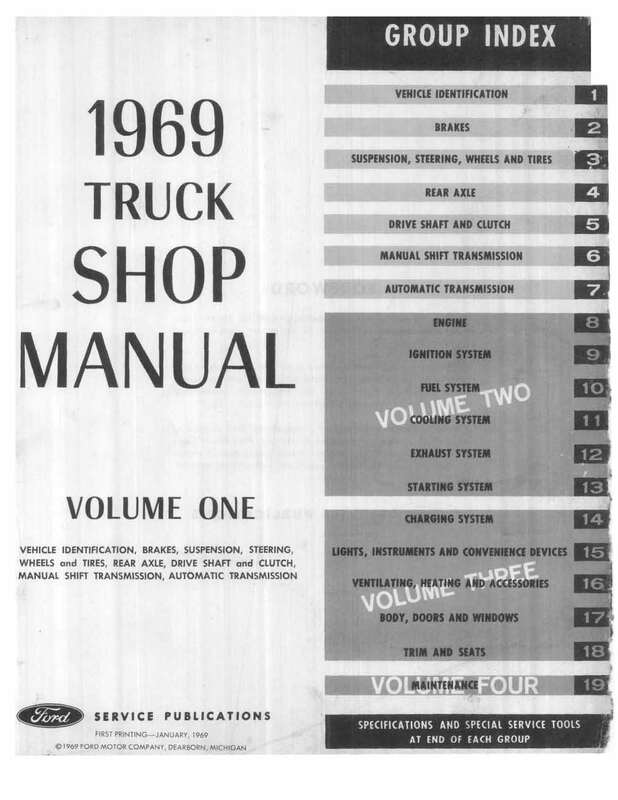 In volume 1 you will find detailed service procedures for wheels, tires, brakes, steering, suspension, driving axles, drive shafts, clutch, manual transmissions, and automatic transmission. In volume 2 you will find step by step repair instructions for gasoline engines, diesel engines, ignition system, fuel system (gasoline and diesel), exhaust system, cooling system, starting system, and emissions controls. In volume 3 you will find out how to work on charging and lighting systems, instruments, clusters, and controls, main wiring harness, circuit protection, auxiliary equipment, ventilating, heating, air conditioning, seats, window glass and mechanisms, doors, hood, tailgate, interior trim, tops, body shell, exterior trim, frame, and underbody. 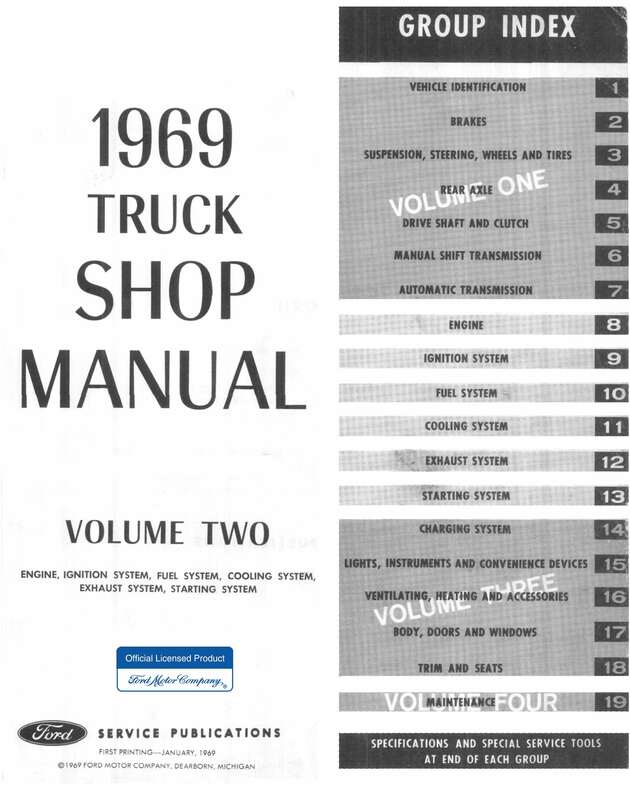 And in volume 4 you will learn about maintenance, lubrication, hoisting, jacking, and towing. 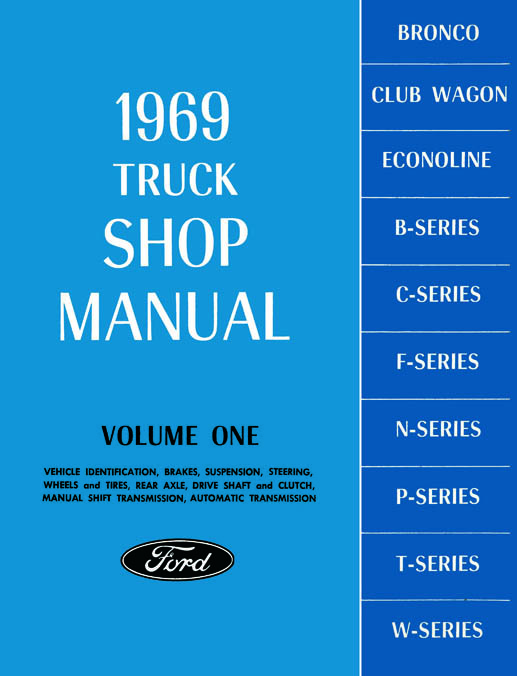 This manual covers all 1969 Ford Truck models including Econoline, Club Wagon; Bronco; F-Series (F-100 through F-1000) P-Series (P-350 through P-6000); B-Series (B-500 through B750); C-Series (C-550 through C-1000 and CT-800 through CT-950); N-Series (N-500 through N-1000 and NT-8000 through NT-950-D); T-Series (T-800 through T-950-D); and W-Series (W-1000, WT-1000).